Whilst we wholly believe that anything to help keep families out of Court is a good thing we also know that for mediation to work people must be in the right place, ready and able to discuss rationally and honestly matters that will affect all those involved for possibly many years to come. With friends, family, employers, schools and GP’s supporting parents through the early days after separation and ensuring they are looking after themselves properly parents can successfully continue doing the best for their children and themselves whilst considering all their options. Time is a priority and when people are given the time and support they can begin to build their confidence and consider one-to-one discussions which can then be extremely beneficial for all by allowing parents to remain in control making decisions about their children and their future. There is a danger, that by forcing people to do things that they are not ready or willing to do can lead to further problems, false allegations being made, wrong decisions and so on, all of which have an impact upon the children and becomes costly to society in the future or may even end up back in the courts. 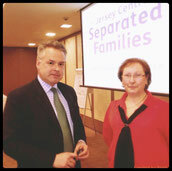 The Jersey Centre for Separated Families remains committed to supporting parents to achieve collaborative, non-court based agreements whenever this is possible. Our unique service can support parents to deal with the emotional and psychological challenges that divorce and separation can bring and can ensure that parents are in the best place to reach agreements that will be sustainable for them and their children over time.